This page introduces some aspects of mistletoe biology, starting with an explanation of what mistletoe is, a description of the ‘original’ mistletoe of Europe, followed by a brief discussion about the many other mistletoes around the world. There’s a quick link index below to this information and the allied page on mistletoe hosts and habitats. Large growths of Mistletoe, Viscum album, on a Poplar tree. Poplars are a particularly susceptible host in Britain and northern Europe. The familiar white-berried Christmas mistletoe of Europe is just one of many hundreds of mistletoe species worldwide. All are plant parasites, growing on tree branches (though a few grow on roots), and in their native lands many have similar folklore and superstitions to our own species. Strictly speaking most mistletoes are only ‘hemi-parasitic’ as most have green leaves to photosynthesize and rely on their host for ‘just’ water and mineral nutrients. But the interaction is often more complex than this, with some exchange of metabolites between host and parasite vascular systems too. Many have peculiar pollination systems, and most have interesting insect and bird associations too. As parasites they do, of course, seriously distort and suppress the host branch they grow on. That’s not a problem if just a few branches are affected – but if the mistletoe becomes established on every branch it’s bad news for the tree and, ultimately, the mistletoe. This diagram, from Julius Sachs’ 1887 Lectures on Plant Physiology, shows a mistletoe ‘haustorium’ – the distortion of the host caused by the infection. This is fairly simple example. A tree with too much mistletoe will suffer from insufficient of its own foliage, become water- and wind stressed because of the mistletoe growths and may well die prematurely. The problem can be easily reduced through active management, pruning the mistletoe back from time to time, but sometimes it does get out of hand. For information on a long-term survey project researching mistletoe management in Britain visit our Mistletoe Survey page. Mistletoes pose intriguing biological and evolutionary questions for the biologist, and sometimes problems for tree managers and foresters, but to most people they are only interesting for their traditions and folklore – especially the Christmas kissing tradition. Visit the Tradition pages for more about that! The native mistletoe of northern Europe, to be found in wide area from parts of Asia in the east across to Britain in the north-west, can arguably be called the Original Mistletoe. It is this species, Viscum album, that is at the core of most of the popular traditions and legends about mistletoe, including the association with Christmas, the Kissing tradition, and the ancient associations with Druids, Romans, Norse gods etc. It is also the main mistletoe species with ancient and fascinating modern medicinal uses. The Original Mistletoe of legend – Viscum album. Native to Britain and Europe and with a unique and distinctive branching and leaf pattern. Many of those traditions have spread around the world but, as the original mistletoe is European, the traditions, particularly the kissing one, have to make-do with alternative mistletoe species in America, Australia etc. None of those other mistletoes quite match our original in appearance – Viscum album is uniquely formed – but that doesn’t seem to bother people too much! Technically speaking Viscum album exists in several subspecies, and the ‘famous’ one is Viscum album subspecies album, a form that grows on a wide variety of deciduous trees. The mistletoe itself is, of course, evergreen so it is a particularly peculiar sight on deciduous tress during the winter months. Some other subspecies of Viscum album grow on evergreens, including Firs and Pines in parts of Germany, France and Switzerland. It is much less obvious on these evergreen trees. For more about other mistletoes visit our Other Mistletoes and Other Parasitic Plants pages too. There are about 1500 species of mistletoe around the world, and all of them are shrubby plants that grow parasitically on trees. Most grow in the tropics and subtropics, with relatively few species in northern temperate areas. Exact numbers, and their botanical classification system, are both variable, depending on current fashions in botanical naming. There are, traditionally, two main mistletoe families, the Viscaceae (which includes our Viscum album) and the Loranthaceae, which includes many of the more colourful tropical species. The Viscaceae is currently considered (under the current APG system) to be a subgroup of the much larger Santalaceae, or Sandalwood family. That family includes many other parasitic species as well as the former Viscaeae species. There are a handful of other mistletoe species within Europe. The most striking is the red-berried Viscum cruciatum, mostly found in Spain. It is very similar to V.album, differing largely in berry colour. We also have one species of Dwarf Mistletoe, the mistletoe group that causes so much damage to forestry in North America (see notes on American mistletoes below). Ours is Arceuthobium oxycedri, a tiny mistletoe found on Juniper bushes and trees in Spain and around the Adriatic coast and Greece. You have to look hard to find this one. We also have one member of the Loranthaceae mistletoes, which are more at home in the tropics. This is Loranthus europeaus, a yellow-berried species that grows mainly on oak trees in central southern Europe. A mistletoe that likes oaks may sound exciting, especially to those inclined to Druidism, but sadly this species is deciduous, so it doesn’t have the cachet of our evergreen Viscum album in winter. 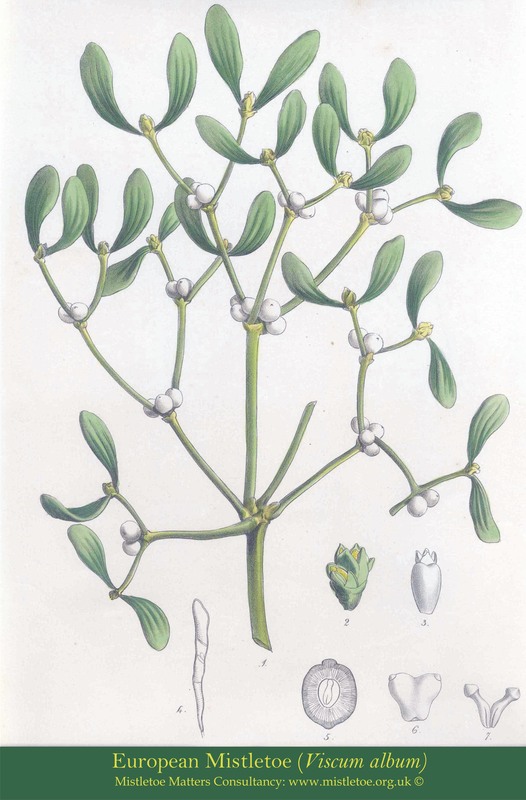 There are many mistletoe species across North America, but the best-known are the Phoradendron species, a group used at Christmas instead of the original Viscum album of Europe. Though allied to Viscum, the Phoradendron species look very different, lacking the symmetrical branching patterns and leaves of Viscum and looking, to be frank, fairly ordinary. But they do have evergreen leaves and white berries in common, so can be considered a rough match. Their ordinary appearance does cause a little confusion though, and there is some evidence that some Americans now use Holly, a much more distinctive plant but certainly not a mistletoe, for the kissing custom! The American Phoradendrons, often simply known as leafy mistletoes, are southern species, with most of the Christmas supply coming from southern states, notably Texas. Europe’s Viscum album has colonised a few areas, notably in Sonoma County, California, but it is considered a potential forest pest and growing it in the USA is now prohibited. Arceuthobium americanum, growing on Pinus contorta in British Columbia, Canada. Other mistletoes in North America include the Arceuthobium species, or Dwarf Mistletoes. These tiny plants have small scale-like leaves, are almost holo-parasitic (most mistletoes are only hemi-parasitic).and can cause significant damage to forest trees. These mistletoes are so damaging that there are many publications and guides to their control. One of the most comprehensive publications is US Agricultural Handbook 709: “Dwarf Mistletoes: Biology, Pathology, and Systematics”. If you’re interested it can be downloaded here. Africa has hundreds of mistletoe species, with most from the showy Loranthaceae, whose long colourful flowers are a complete contrast to our European Viscum. But Viscum species occur there too – indeed over 40 species of Viscum can be found in mainland Africa and over 30 more in Madagascar. Two contrasting species are pictured here, the tiny Viscum minimum and the more conventional V. triflorum.. The Loranthaceous mistletoes are Africa’s most obvious and characteristic species. There are far too many types to discuss in detail here so, if you’re interested why not buy Roger Polhill and Delbert Wiens’ book Mistletoes of Africa. Published by Kew Gardens in 1998, the book covers the biology and phytogeography of all the African species and describes several hundred species, in both the Viscaceae and Loranthaceae. The cover picture of the book shows the flowers of the loranthaceous mistletoe Spragueanella rhamnifolia. Mistletoes aren’t the only parasitic plants – there are lots of others. Many of them are much less obvious than mistletoes and you may walk past some of them every day. That’s because, apart from the mistletoes, most parasitic plants grow on their host’s roots, and above ground many just look like ordinary plants. Ordinary-looking parasitic plants of Britain and Europe include many hemi-parasitic members of the Scophulariaceae family, and include the familiar Yellow Rattle (Rhinanthus), Red Bartsia (Odontites) and Eyebrights (Euphrasia). None of these look like parasites – they seem to be innocent-looking wild flowers – but under the ground their roots are busy linking to, and parasitizing, their fellow plants’ root systems. You can’t easily appreciate this because they’re hemi-parasitic, and have their own green leaves. But some of their relatives are holo-parasitic, with no photosynthetic green of their own, and so they are a little more obvious. Examples of these include the Toothworts (Lathraea), and the Broomrapes (Orobanche). The Dodders (Cuscuta) are another group of parasites. These are a bit like herbaceous mistletoes, growing up and over their hosts during summer and dying back in winter. Where they touch the host stem they form small haustorial structures, linking into the host plants vascular system. Virtually leafless themselves the Dodders are largely holo-parasitic. People sometimes get a bit confused by what is or isn’t a parasitic plant. Ivy (Hedera) and Bindweeds (Calystegia and Convolvulus) are often considered parasitic by some gardeners – but they aren’t, they’re merely climbers. Other plants (some orchids for example) are saprophytic, living on decaying material from other plants, or have a mutually beneficial mycorrhizal association with soil fungi – but none of those are technically parasitic. Poster: The Mistletoe Matters Consultancy has a mistletoe poster available to download. It’s a large file (about 1.2 MB) and is optimised to print at about 300 by 450 mm. Postcards and cards: The English Mistletoe Shop has a small stock of mistletoe postcards and other cards featuring historic prints of mistletoe. The postcards are in a mixed pack of 4. Click here or the links below to visit the shop.